The Battle with "the Bottle"
In North Dakota's "Territorial Days," beer and other forms of alcoholic beverages flowed freely. 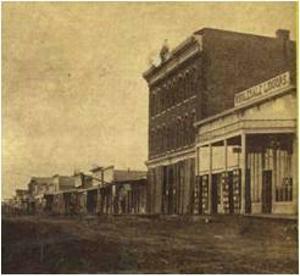 Several liquor stores and taverns were found on Mandan's Main Street. Charles Roby, for example, operated a saloon starting in June 1887 on Block 5 (i.e. today's 200 block on east Main St.). Curley Sublette's saloon was the popular resort for cowmen and old-timers. Prohibition of liquor sales was proposed at ND's Constitutional Convention in 1889. Temperance leaders had denounced the lawlessness of the saloonmen and accused them of influence in the selection of local officials. To avoid endangering the radification of the constitution, the attendees agreed to offer the prohibition clause to voters, separately. Territorial voters approved the prohibition clause by a total of 1,159 votes. Germans in western North Dakota resented prohibition, which they thought was "forced upon them by Scandinavians in the Red River Valley," according to historian Bill G. Reid in his publication, The North Dakota Political Tradition. While both states were "dry" when they joined the Union on November 2, 1889, South Dakota dissolved its prohibition in 1895. In 1915, the ND voters approved a referendum even more severe. Temperance movements had swept through portions of the nation in the early 1900s, but it was World War I that provided the opportunity for the anti-alcohol movement to enact a national ban on alcohol. Its first step was to convince Congress to pass the Lever Food and Fuel Control Act of 1917, which regulated food, fuel, and other commodities that might be needed for the war effort. 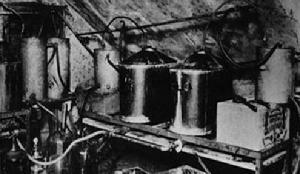 It was argued that the grains needed to distill alcohol were needed as food and were in short supply because of the war. This effectively shut down the country's breweries and distilleries temporarily. A permanent ban on the sale, transportation, importing, and exporting of alcoholic beverages was enacted by passage of the 18th Amendment to the U.S. Constitution by Congress in December, 1917. In 1918, the ND legislature ratified the 18th Amendment to the US Constitution (the fourth state in the Union to do so) by an overwhelming majority. It took just over one year for the Amendment to be ratified by enough states. Prior to the national ban, individual states had passed local bans, and by 1916, North Dakota and 25 other states banned alcohol. Proponents of the so called "noble experiment" claimed that the nation's health would improve dramatically without alcohol, and that crime would drop. It was also claimed that other industries, like dairy, would prosper as other types of beverages increased in popularity to fill the void left by the absence of alcohol. Juvenile delinquency was also supposed to be virtually eliminated, and the average workers productivity was also supposed to increase, leading to an increase in economic prosperity for the nation. 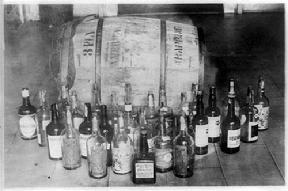 The Prohibition era lasted from 1920 through 1933, and was an attempt to legislate morality. It took a Constitutional amendment to enact it, and another one to repeal it. The attempt to decrease the "evils" of alcohol actually created more - and new - types of crime. While more prevalent along border towns adjacent to Canada and Minnesota (which allowed liquor sales from 1889 until 1920), Mandan has its share of bootlegging and "blind pigs" stories. 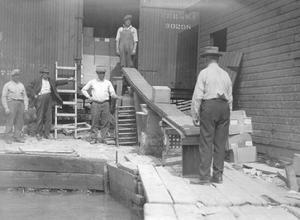 Federal prohibition officers raided illegal liquor operations across North Dakota during the 1920s. In 1923, a 100-gallon still was smashed on a farm near Medina. Other specific events, including raids, would be highlighted in local newspapers such as the Mandan Pioneer. On December 15, 1910 Mandan's commissioner of police Patrick McGillic was arrested for "unlawfully and knowingly permitting a portion of the building controlled by him, namely a suite of rooms upstairs in the building ... also known as the 'McGillic and Olson Building' ... to be used as a place where intoxicating liquors were sold...."
In April, Julius Tifft was arrested by Morton County Sheriff Charles McDonald on the charge of causing a common nuisance. Tifft was allegiedly operating a "blind pig" in a small building at the Heart River bridge on the road to the State Reform School. Three bottles of Grain Belt beer were confiscated from the premises. The "largest still in N.D. history" was taken in 1928, a 14-foot long, steam-operated contraption seized in Mandan. The citizens of Mandan could finally enjoy a foamy stein of 3.2 beer legally for the first time in its history when the new beer law, approved by state voters on September 5, 1933 special election, went into effect on Monday, October 22, 1933. Nearly 2,000 retailers in North Dakota applied for state and city beer licenses, including these Mandan retailers: Toscas Billiard Parlor, Mandan Recreation Parlor, John Winbauer, Dakota Hotel, the Mint nightclub and John Senn, St. Joseph Verein, New Palace Cafe and the Smoke Shop. Mandan retailers will pay $125 a year for "on sale" retailers while "off-sale" retailers initially paid $25. Some counties in North Dakota remained "dry" until 1947, while a few cities maintained prohibition until the 1980's. Mississippi was the last state to lift its ban on liquor sales in 1966. Agents of the state regulatory department swooped down on a �boxcar� warehouse used to store illegal beer. State agents launched a surprise attack on the boxcar, located on east Main Street and found more than 1,700 gallons of beer. More than half of it was the so-called �6 percent beer� and is stronger than allowed by the state beer law. Named in the warrant as licensee was Sam Sloven, Bismarck and Mike Guon, Mandan beer dealer who was acting as his manager. In August 1935, Judge H. L. Berry sixth district court judge issued orders to padlock seven Mandan area beer tavers as a follow-up to raids by state regulatory department and beer commission officers. The businesses were The Stag, the Mint, the Cave and the LogCabin in Mandan; the Showboat on the Missouri River Near Memorial hgihway; The Dome pavilion and the Tavern, both east of Mandan on "the Strip." The injunctions are issued on three nuisances counts - liquor, gambling and conduct offending public dencenty and morals. Owners were eligible to post bond and reopen, however Judge Berr had already left town for a week. In January 1936, members of that attorneys declared were the largest illegal liquor ring ever uncovered in the state were sentenced from three months to sixteen months. Mike Guon of Mandan received 16 months to be served in a federal penitentiary, while Joe Gold of Mandan and four Devil's Lake men received six months in the county jail. The defendants were all charged with conspiracy in transporting untaxed alcohol from Wisconsin by car and freight train. Charges also included storing the liquor in unlicenseded warehoused in the Mandan and Devils lake vincinities. In November 1936, voter turnout across North Dakota set new records driven by a highly contested three-way race for governor which saw William Langer returned to office. North Dakotans also voted to legalize liquor by adopting an initiated measure which put the state in the �wet� column for the first time since statehood. Twenty hard liquor and beer licenses representing a decrease of six from 1936, were issued by the City Commission. The approved applications included 14 for combination hard liquior and beer, two for liquor only and four for beer only. License fees reamian at $450 for liquor, $150 for beer and $600 for a combination permit. The list of licenses for both liquor and beer include: Korner Bar, Joe Wetzstein; Mandan Recreation, Nick Paul; Union Hotel, John Winbauer; Beehler's Place, George Beehler; Pete's Place, Peter Huncovsky; Owl CLub, Leo J. Eckroth; New Deal, John Sann; Tap Room, B. M. Regan; St Joseph's Verein, Albert Heinz; Messmer's Confectionary, J. M Messmer; Th Cave, Leo and Mike Guon and Joe Gold; Henry's Place, Henry J. Schafer; and Kopp's Koffee Shop, Byron H. Kopp.